With the dust settling in Los Angeles from the recent teacher strike and Denver up next, speculation is building that more strikes will follow around the nation. As they occur, let’s hope that districts and teachers unions can serve as role models and offer a lesson around civility and civics for the nation’s children. Doing so would also help build better relationships, partnerships, and trust between teachers and administrators to better serve students. Judging by the case of Los Angeles, we still have work to do. In a national climate of turmoil and suspicion, injecting more incivility into the mix sets a poor example for students and misses the chance to heal our broader political culture. To change this, each side in future strikes should start with the premise that the other is doing what it earnestly thinks is in the best interests of students and, likely, teachers. Somehow we have forgotten how to do this as a society. We don’t give people the benefit of the doubt. We rush to question their intent and intelligence. Our country has seen periods of deep incivility in our politics before, but we have demonstrated that we are a nation that can disagree and not be disagreeable. We should question the impact of people’s proposals and actions. But if we are to make progress in negotiations and heal society’s rifts, there should be a high bar before we cast aspersions on motive and character. In Los Angeles, both sides likely honestly believed that the policies and proposals of their opponents would lead to catastrophic results. Each was right to forcefully make its case and fight for what it thinks is right. But it’s hard to believe that after a successful career in business and philanthropy, Beutner took the job with the mission of hurting students and teachers, as was alleged. 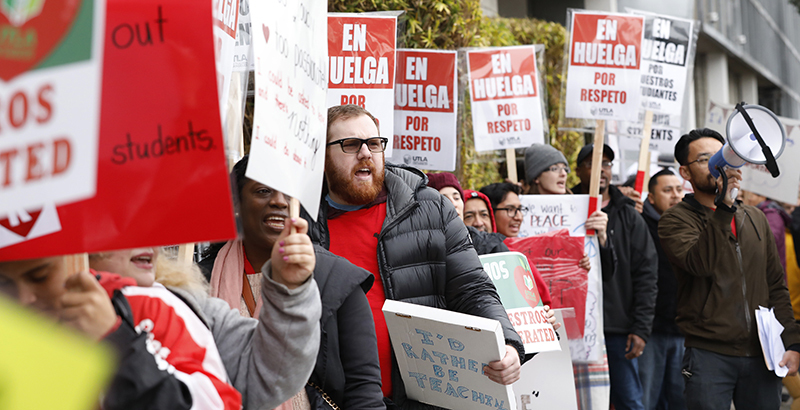 And, despite the warnings of some observers, it’s just as unlikely that United Teachers Los Angeles President Alex Caputo-Pearl would aim to bankrupt the district in seeking a settlement or promote his members’ interests at the expense of students. The behavior we saw during the strike is unlikely to build trust. It won’t solve the real structural challenges that many districts face, with massive looming pension and health care payments for retired teachers diverting funds that could otherwise be used to provide proper raises for current teachers. Worse, it sets a terrible precedent and model for our students, who should represent our best hopes and dreams for the future and better politics for this country. Those hopes should be pinned on honest civil dialogue and a frank debating of the issues, merits of different positions, and systematic impacts. And those dreams should be modeled upon the idea that we can disagree vehemently with people, yet rise above those earnest differences to believe in their inner good rather than default to believing that they are inherently evil. As the father of two young children, I want them to learn this lesson in their schooling. More than listening to lessons in a class, they will learn by watching our actions. Michael B. Horn is chief strategy officer of the Entangled Group, a venture studio focused on helping the education ecosystem transition from supporting an industrial economy to a knowledge one; founder of the Clayton Christensen Institute, a nonprofit think tank; and the author of multiple books on the future of education.